Democratic candidate for United States President, senator Bernie Sanders speaks during a town hall meeting in Conway, New Hampshire, USA, 24 August, 2015. Iowa - U.S. presidential candidate Bernie Sanders narrowed the gap with leading Democratic rival Hillary Clinton in a recent opinion poll in the political bellwether state of Iowa as support for the front-runner fell below 50 percent for the first time this year. Clinton, former secretary of state and first lady, remained the top choice for 37 percent of likely Democratic voters in the party’s nomination contest, down from 50 percent in June, according to the Des Moines Register/Bloomberg Politics Iowa Poll released late on Saturday. But Sanders, a longtime independent lawmaker from Vermont, was favored by 30 percent of respondents, skyrocketing from single-digit support early this year in the race to become the Democratic Party nominee for the November 2016 presidential election. 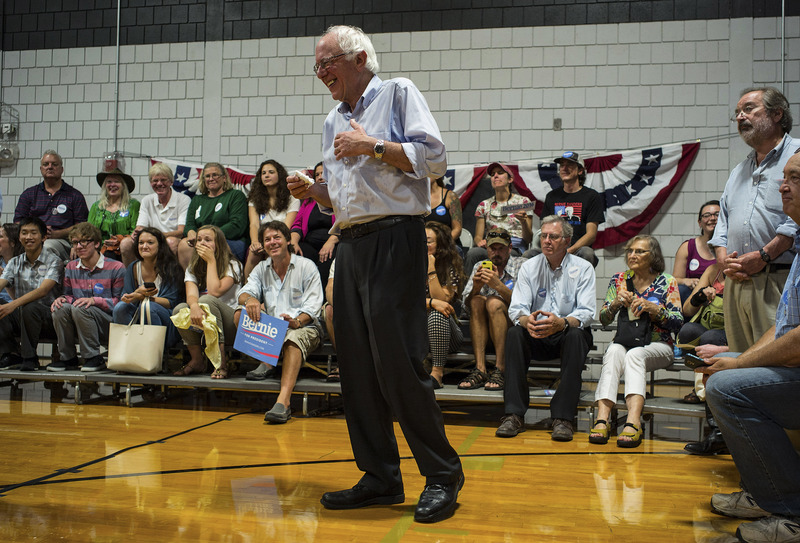 On Sunday’s talk shows, Sanders attributed his gains to his own growing popularity and not Clinton’s losses. But Clinton has faced eroding support in several opinion polls as she struggles with an image of perceived dishonesty amid a controversy over her use of a private email account when she served as America’s top diplomat. The latest Reuters/Ipsos poll on Friday found support for Clinton among Democrats dropping to its lowest point since 2012 after earlier polling had found a decline in Clinton’s perceived trustworthiness. The Federal Bureau of Investigation is looking into the security of the private server and whether any classified information was on it, and Republican presidential candidates have seized on the scandal. “No one is above the law… She believes certain laws only apply to her,” one of the candidates, New Jersey Governor Chris Christie, said on “Fox News Sunday,” also suggesting that Clinton should face prosecution if investigators find mishandling of diplomatic emails. Clinton says she did nothing wrong and only used the private account because of convenience. Sanders has staked out a liberal platform in his campaign, touching topics that include minimum wages, economic inequality, campaign finance reform and climate change. His campaign website, however, omits the issues of national security and foreign policy. On Sunday, he faced questions about his votes against U.S. use of military force in Iraq and in Syria, as well as the first Gulf War, but in support of the initial invasion into Afghanistan. Despite his flaws it will be great to have a guy from Brooklyn in the White House. It would make Marty Markowitz even prouder of our borough. Reply to 1. Not sure if you're joking, I must assume you are. Isn't this once great city a tragic wreck with a communist as mayor? Now you think it would somehow be cute to have a communist as president of the USA? Hasn't Obama done enough damage!